Ian joined United from Musselburgh Athletic initially on a provisional form. He made the breakthrough into the first team by October 1967 and although he was a frequent starter in the line up over the next three years, he played as often in the reserves as he did in the first eleven. 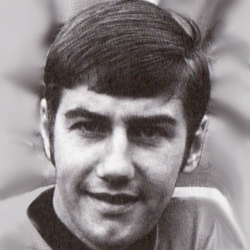 Ian was released at the end of 1970-71 and then joined Dundee. Ian was born on this date in . United's last match of the season meant absolutely nothing with a Fairs Cup place having already been assured with fifth place in the First Division already confirmed. There was a tragic start to this match for United at Somerset Park. Ian Scott contested an aerial ball with Young and fell awkwardly and had to be carried off on a stretcher. Despite this blow, United dominated the match for long spells. Apart from a brief spell before the interval little had been seen of the home side, but it was they who took the lead in the 66th minute. The Tannadice defence had just repelled an offensive by Ayr when the ball broke to Quinton Young. Instead of making the anticipated pass, however, the winger sent a low shot flashing into the net from 20 yards. The visiting Tannadice side were in complete command for most of the second half, but that old familiar failing - lack of goalscoring ability - meant that United failed to turn their pressure into something more tangible and consequently they returned home from Ayrshire pointless - their third successive defeat in the league.